JPMorgan is expected to report first quarter results on April 12. The stock has entered a period of heightened volatility creating an elevated risk for the stock. The valuation for the stock is high based on a price to tangible book value. JPMorgan Chase & Co. (JPM) will be one of the first big banks to report results this Friday morning, April 12. It is not expected to be a strong quarter for the company, as consensus analysts' estimates are for no revenue growth, and earnings growth of just 4%, according to data from YCharts. However, the bank faced many headwinds during the quarter, making the results anything but a sure a bet. 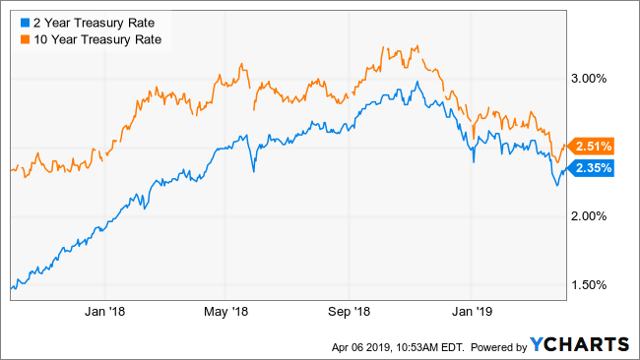 A pivot in monetary policy by the federal reserves caused Interest rates collapsed during the first quarter, with spreads in the yield curve inverting at certain points. Meanwhile, initial public offerings fell sharply during the quarter, in part due to the U.S. government shutdown. Additionally, volatility in the bond and stock markets may have sent investors to the sidelines, causing volumes in their trading business to fall. However, analysts' revenue estimates only fell 3.6% during the quarter, so the big question is if those expectations fell enough. 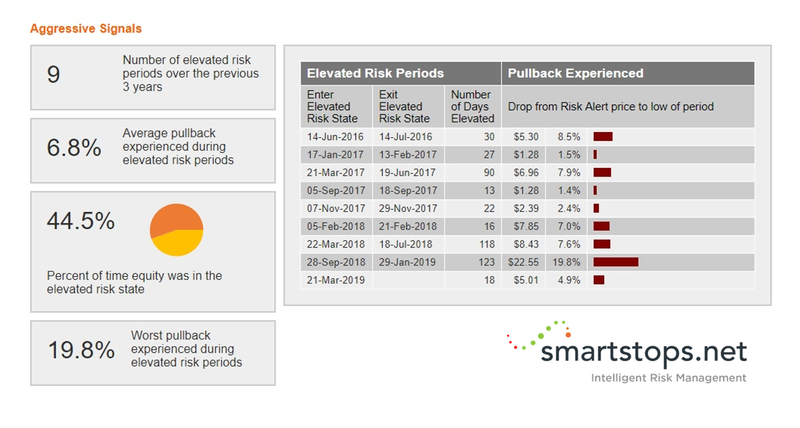 Our SmartStops proprietary risk model shows that JPMorgan's stock has entered a period of elevated risk starting on March 21. Since this alert was first triggered, the stock has fallen by $5 or 4.9% through April 5. Previously, in Sept. 2018, when SmartStops alerted at $113.66, the stock declined almost 20%. Over the past three years, the stock has entered this heightened risk state nine times and has pulled back an average of nearly 7%. The options market is also anticipating a heightened level of risk heading into the results. The in-the-money options for expiration on April 12 have an implied volatility level of about 25%. That is nearly three times greater than the current implied volatility reading of around 9% for the S&P 500 SPDR ETF (SPY) - a proxy for the S&P 500 index. One reason for the heightened risk going into the results will be the equity underwriting fees. According to data from Renaissance Capital, the number of Initial Public Offers (IPO) fell by more than 50% in the quarter from a year ago to just 18 from 44. Proceeds fell even more dropping to $4.7 billion from $15.5 billion. The poor results will likely weigh on JP Morgan's unit, which already struggled in the fourth quarter of 2018 with revenue declining 4% versus last year, and 17% sequentially. It likely means that revenue for the unit will come in even below the $348 million in the fourth quarter and $346 million in the first quarter of 2018. Interest income saw its revenue rise in the fourth quarter to $21.0 billion, its highest levels of 2018. However, that was during a time when interest rates were rising, peaking at roughly 3.25% on the 10-year Treasury and around 3% on the 2-year Treasury. Since then rates have plunged, with the 10-year yield falling nearly 90 basis points and the 2-year yield falling nearly 65 basis points to levels not seen since the fourth quarter of 2017. It could result in interest income falling back or below its fourth quarter 2017 reading of around $17 billion. Investors will also be paying close attention to the equity and fixed income market units which have had four straight quarters of declining revenue. The first quarter of 2018 was the peak of the cycle for the units, making the comparisons very difficult to beat. Another weak quarter out of these two units could cause an added level of concern. Those are not the only problems the stock faces because 2019 is expected to be a challenging year, with revenue forecast to rise 3.3% and earnings to climb by 8%. The slow earnings growth is one reason why the stock trades at a 2020 earnings multiple of 10. Even worse is that earnings growth is expected to be slower in 2020, at 7.6%, and slower still in 2021 at only 4%. 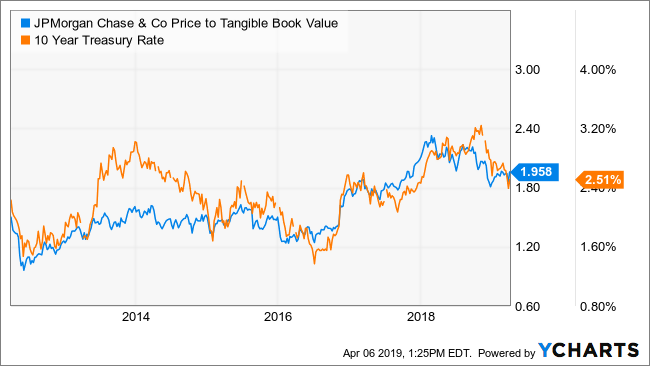 Even with the equity's sharp decline from its peak, it still trades at a price to tangible book value of nearly 2, which is at the upper end of its historical range since 2012. Before the U.S. Presidential election in November 2016 and the big reflation trade, the bank's price to tangible book value peaked at 1.6 on two occasions in 2014 and 2015. Should yields continue to fall, there is a very good chance that the price to tangible book value multiple continues to contract back towards 1.6%. Of course, there may be some areas in which we could be wrong in our assertions. Just because the number of IPOs declined sharply does not mean that revenue for the investment banking unit declined as sharply. It is entirely possible that JPMorgan still collected as many fees if not more fees then it has in prior quarters. Additionally, lower interest rates may have hurt interest income levels, but it is also possible that it helped to spur more loan growth than expected. Finally, the added bond buying from the falling rates may have helped JPMorgan's fixed income desk generate more revenue due to increased trading volumes. It would seem from judging by our internal model and the options market that the risks are high going into this earnings event. While it is not entirely possible to project the exact outcome, we can most definitely point to many external factors that may end up having a significant impact on the overall business. This is likely why the risks seem so elevated this quarter.